The pattern and all the yarn needed to weave the Imperial Ruana from the January/February 2013 issue is included in this Kit for weavers. Introducing the first-ever Kit for weavers! 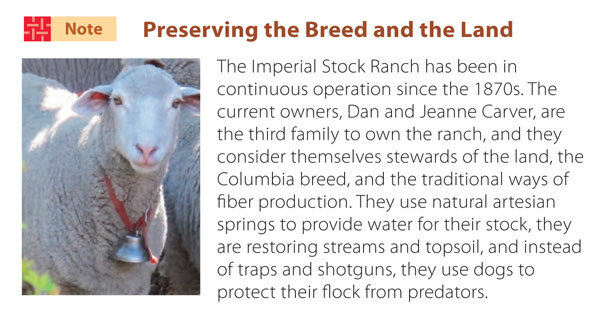 Handwoven has teamed up with Imperial Stock Ranch to provide weavers with an exclusive Kit. You'll enjoy the entire electronic version of the January/February 2013 issue of Handwoven magazine AND all the yarn needed to weave the Imperial Ruana project featured in this issue. Plus, this Kit is now available for only $129.99! With the pattern instantly downloaded to your computer (along with other great articles, patterns, and weaving tips for Handwoven's January/February issue), you'll be ready to warp the loom for this classic Ruana project. All the yarn you need to make the Imperial Ruana as shown in Handwoven January/February 2013! Included in this Kit are 3 skeins of Imperial Yarn's Tracie Too in #314 Chocolate and 1 skein each of Imperial Yarn's Tracie Too in #351 Autumn Rust, #23 Black, #315 Wild Rye, and #326 Denim Dusk. The digital download of Handwoven January/February 2013. Learn all about the diverse properties and weaving possibilities of "varietal" wools such as Jacob, Columbia, and Karakul. Learn how to pick the best wool for your project using Robin Lynde's "Weaver's Guide to Wool." Plus, keep warm with Beverly Jones alpaca scarf designed with the Guy in Mind, Suzie Liles' Imperial Ruana, Yvonne Stahl's Hebridean Cardigan, and Linda William's Versatile Cape in shadow weave. Also included are projects made from wool blends suitable for any season including Sarah H. Jackson's elegant Illusions Vest and Kate Lange-McKibben's huck lace Serenity Shawls. Decorate your house and keep your feet warm with rugs by Tom Knisely and Rebecca Fox. Also in this issue Tien Chiu gives a new view on Complex Weavers and a straightforward explanation of how to turn a draft, and Laura Fry presents fulling in a nutshell. Whether wool is a regular part of your weaving repertoire or you're just starting to weave with this magical fiber, the January/February 2013 Handwoven has what you're looking for. All this would cost $161.99 if you purchased this at retail price. We're offering this Kit for only $129.99, a savings of $32. You only need a 4-Shaft loom! Purchase this first-ever Kit for weavers and have everything you need to weave the timeless Imperial Ruana today. Plus, save $32 when you purchase the Kit from the Weaving Today Shop! *Supplies are extremely limited for this Kit. Order this Kit today before it's gone!